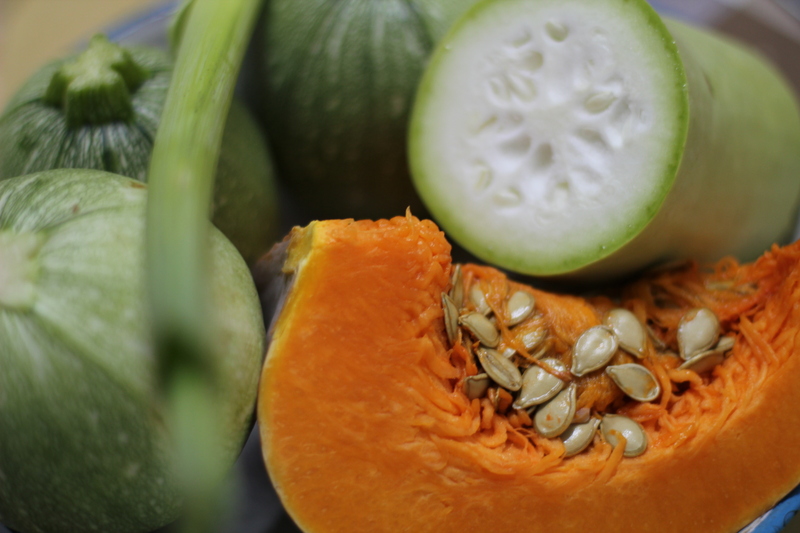 As we draw into autumn pumpkin and other members of the marrow family become more evident at the vegetable markets and greengrocers. 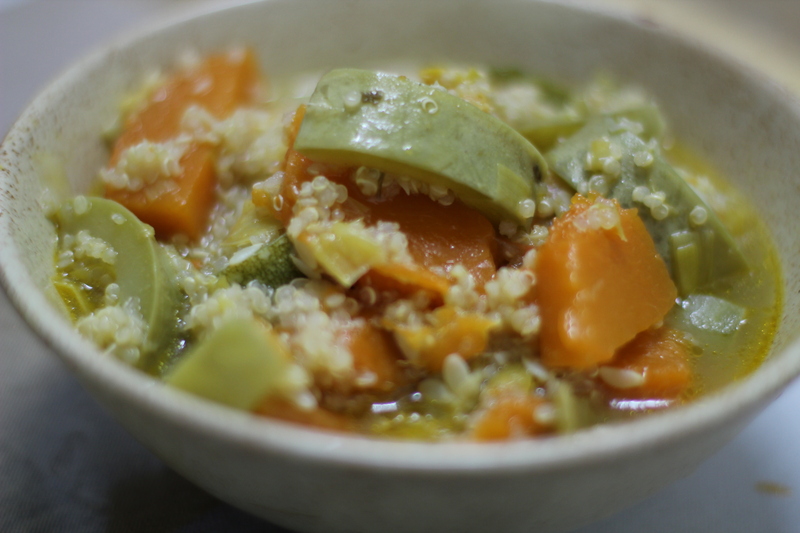 This recipe is a take on a traditional Maltese autumn soup “Soppa tal- Qarghat” made from the different marrows; qagħra hamra (pumpkin), qagħra Tork (white pumpkin), qagħra baghli (courgettes) and qagħra twil (long marrow). Any combination may be used. Squash is fine as well but I prefer vegetables that have been grown locally as this is more sustainable. White Marrow was not available at the market so I used what I found. 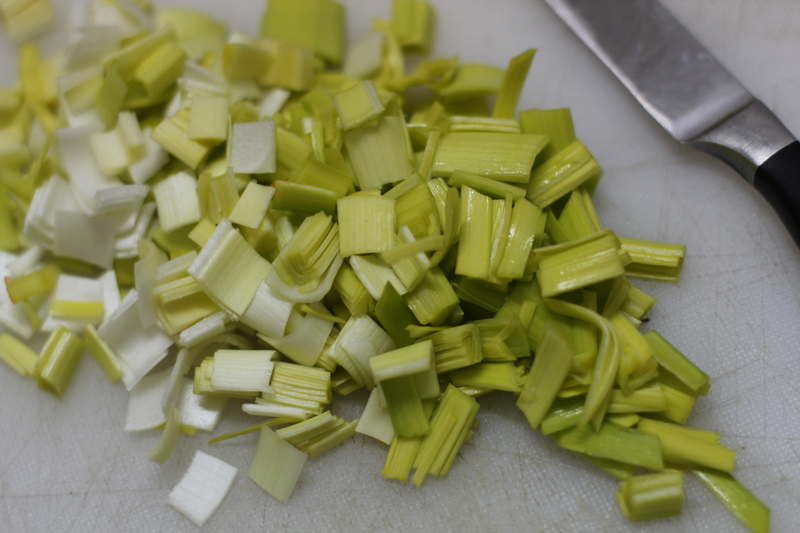 Wash and chop the leek. 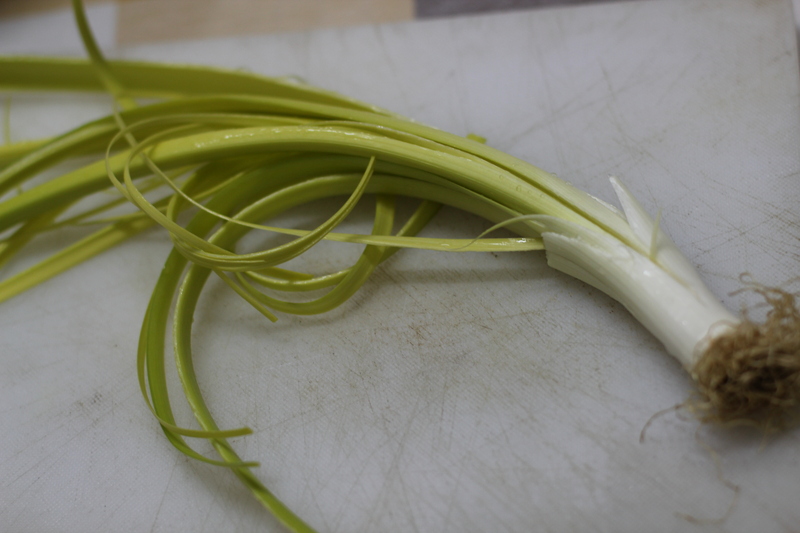 Tip: To remove soil and compost from leek remove the two topmost layers and quarter lengthwise leaving the root. Rinse thoroughly under running water and dry with paper towels. Easily chop into 1.5 cm lengths. Heat oil in pot and gently fry the leeks. When they start to get translucent add the cumin and the chili and fry for one minute to release the flavour. 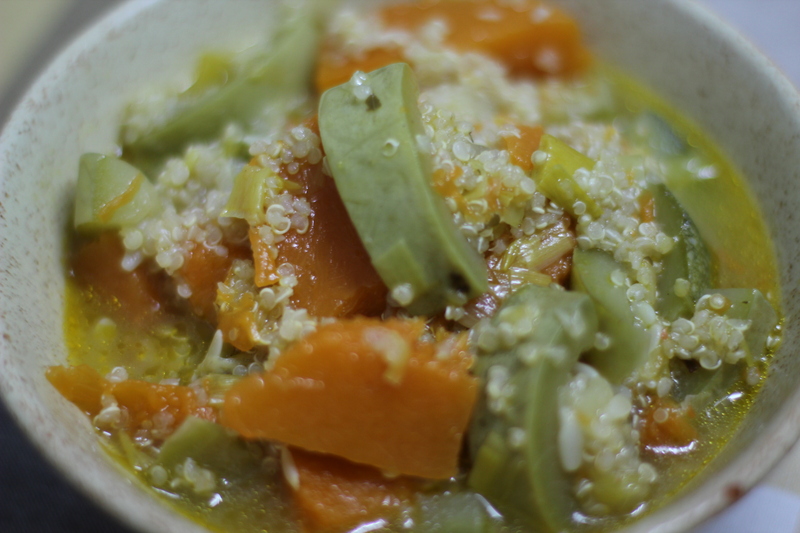 Add the washed and chunkily chopped marrows to the pot and barely cover with the stock. Bring to the boil and simmer for five minutes. Add Quinoa, cover and simmer for fifteen minutes. Leave to rest for another fifteen minutes during which most of the liquid will be absorbed. I served this with grilled flat bread such as flour tortillas. I made this traditional recipe for some very special guests. I will introduce them in good time. Ratatouille is a stew of the vegetables that are so prevalent in the Mediterranean in the summertime; aubergines, courgettes and sweet peppers, which originated in Nice and has been adopted by the Provence region. The circumstances dictated that I prepare a copious amount of the stuff, roughly enough for twelve portions but it is easy enough to calculate how much you want to prepare. 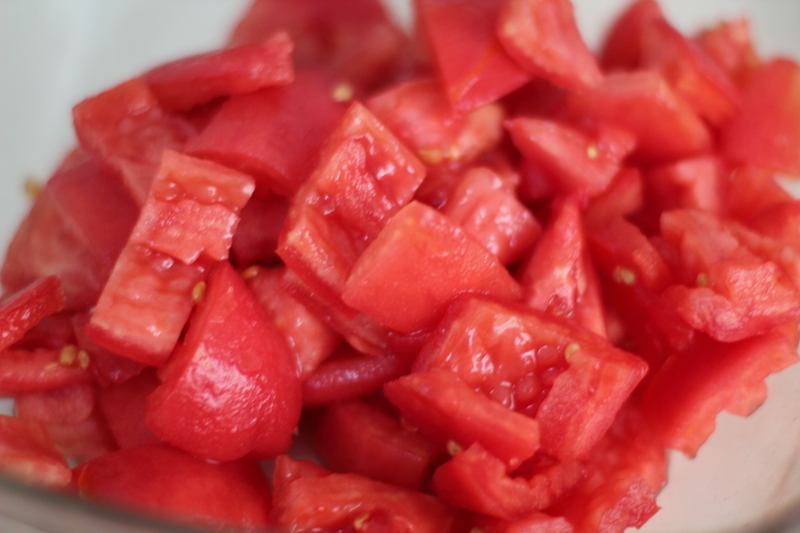 Just keep in mind that you need approximately an equal amount of all the vegetables, maybe slightly less tomatoes. The secret of a good ratatouille is to cook the vegetables separately so each will taste truly of itself. brown them in some of the oil and move them with a slotted spoon to a casserole dish or a large pot. 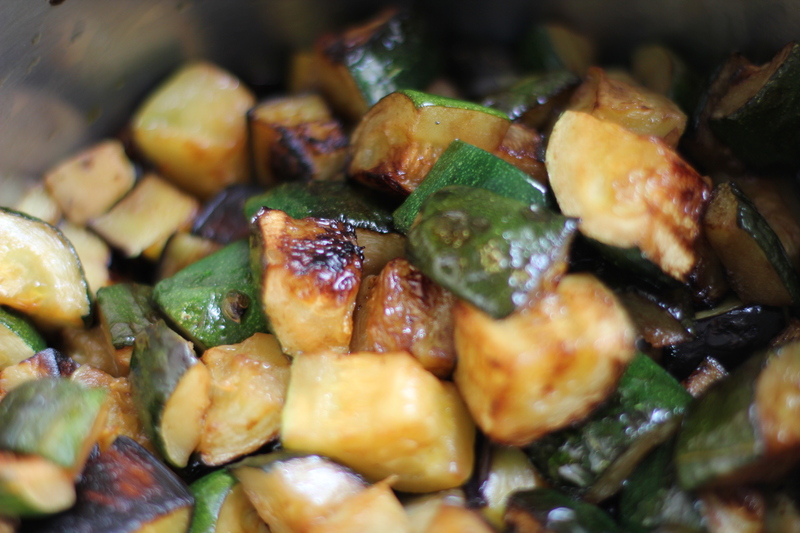 Repeat the process with the courgettes, making sure there is enough oil as the aubergine absorbs a lot of oil. 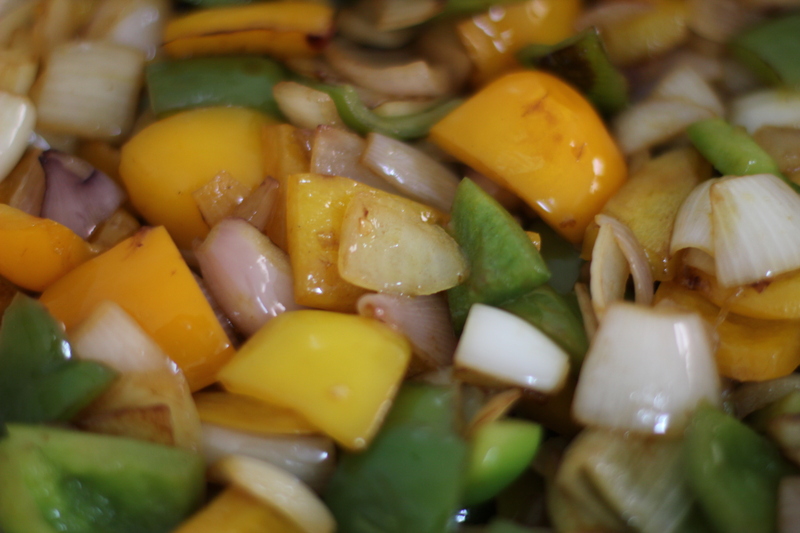 Repeat with the peppers and onions together.